You’ll find the sign “Badia a Conèo” along the road leading from Le Grazie to Casole d’Elsa, after about 1km. 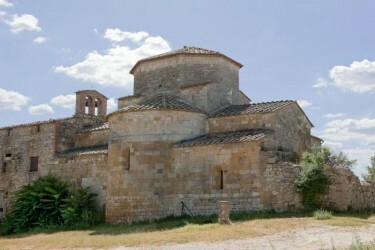 Pass the two cypresses that bound the narrow road and after 2kms you’ll reach the Badia a Conèo romanic style church. It was built round about the year 1.000 near the intersection between the ancient paths Via Francigena and Via Volterrana. In the beginning it was a monastery devoted to San Benedetto’s rules, as it can be argued by an ancient document dating back to the 11th century. During the 15th century it was given “in commendam” to Cardinal Alessandro Farnese, who became later Pope as Paolo III. By the end of the 16th century the abbey had became a parish under the bishopric of Colle di Val d’Elsa, many families went to live there and the church had to be widened. Between 1920 and 1922 the building was restored and brought back to its native simple romanic style.